The purpose of this project is to estimate the nesting densities of an economically-important native crop pollinator as part of a broader effort to understand their value for farmers. Combining genetic approaches, geographic information systems (GIS) and field experimentation I will 1) estimate on-farm nest densities of the common eastern bumblebee (Bombus impatiens), 2) examine whether landscape pattern or management practices explain differences in nest densities between farms and 3) demonstrate how differences in pollinator community responses translate into economic benefits via changes in crop yield. Despite their ecological and economic importance, surveying bumblebee populations is challenging. Novel genetic techniques have begun to allow more rigorous estimates of nesting density. I will, for the first time, connect these techniques with economic analyses to relate nesting densities and blueberry yields in Vermont. My findings will support long-term sustainability of specialty crop agriculture by increasing growers’ ability to better manage pollinators for improved crop yield. Conserving wild pollinators populations on farms reduces environmental and economic risks for farmers and is therefore a critical part of sustainable agriculture. The demand for agricultural pollination services is rising (1) and wild pollinator visitation is increasingly expected to safeguard against crop yield instability (2). Wild bee communities complement the activity of honeybees and ensure pollination for many economically important crops. Often wild bees are more efficient pollinators because they frequent more flowers and successfully transfer more pollen. When compared to honeybees, for example, bumblebees in blueberry farms have a greater visitation rate and deposit more pollen per flower visit (3). Wild bees, such as B. impatiens, are also active over a range of climate conditions (4) and temporal scales (5), and therefore provide pollination insurance in the face of climate change. Bumblebees are the dominant pollinator of many wild and crop plants, yet many species are threatened by agricultural intensification. The rationale of the proposed research is that obtaining measures of bumblebee nest density will inform conservation and management actions that aim to promote viable populations of this important crop pollinator. In spite of their ecological and economic importance, measuring bumblebee population size remains elusive. As social insects, bumblebee nests are made up of many worker-sisters with a single reproductive individual, the queen. Determining population viability (i.e. the number of reproductives) requires estimates of nest density, but data typically collected document abundance patterns of individuals. The problem with abundance surveys is that the individuals observed in a given area may represent multiple nests or the same nest. Put another way, is the number of bees pollinating a farm the result of a few large nest or several small nests? Determining nest density is an issue of conservation concern and farm productivity. Research suggests that farm management activities such as wild flower plantings may improve yields because restoration promotes pollinator abundance and crop visitation. It is unknown whether increased floral availability supports more bumblebee nests or simply contributes to larger colony size (6). It is important from a conservation perspective to understand the discrepancy between colony growth and larger-scale patterns of nest density. From an agricultural perspective it is critical to understand whether management actions actually support sustainable populations of pollinators. Farms with greater nest density spread the risk of colony failure and benefit from pollination services that are robust to local disturbance. Managing for nest density means pollination services will be derived from multiple sources, and more resilient to environmental change. Supporting and promoting wild bees such as bumblebees has the potential to increase the economic benefits farmers receive from pollination. 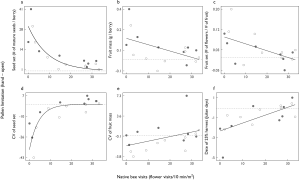 It is well understood that landscape and management factors influence bumblebee abundance. A previous SARE funded project (GN11-028) looked at the effects of landscape composition on nesting density in an annual crop, yet this study neither evaluated the effects of farm management nor performed any economic analysis. What remains untested is whether landscape pattern, as well as farm management, have a similar effect on nest density, and whether variation in nest density between farms translate into differences in crop productivity. My research aims to address four gaps in our knowledge of bumblebee population research: 1) Is nest density strongly related with observed levels of abundance? 2) Are there landscape factors that explain differences in nest density between farms? 3) Are there management factors that explain differences in nest density between farms? 4) How are crop yields influenced by landscape pattern, management factors, and nest density? Answering these questions is critical to understanding what measures farmers can take to sustain populations of bumblebees in agricultural landscapes. The proposed research provides new information and addresses, in economic terms, a specific need of farmers. Our ongoing research has demonstrated that Vermont blueberry farms are pollinator-limited, meaning that some farm’s yields could be improved if more pollinators were present. My research will connect agricultural landscapes, bumblebee populations and yield gaps in a novel and previously unreported way. I will employ a combination of genetic and GIS techniques, thereby advancing the science of measuring pollinator populations in agricultural landscapes. Understanding the relationship between nest density and farm practices and/or landscape pattern will inform management recommendations to farmers who are in need of a suite of tools to maintain diverse and healthy pollinator communities. 1. I. Koh et al., Modeling the status , trends , and impacts of wild bee abundance in the United States. Proc. Natl. Acad. Sci. 113, 140–145 (2016). 2. L. a Garibaldi et al., Wild pollinators enhance fruit set of crops regardless of honey bee abundance. Science. 339, 1608–11 (2013). 3. S. K. Javorek, K. E. Mackenzie, S. P. Vander Kloet, Comparative pollination effectiveness among bees (Hymenoptera: Apoidea) on lowbush blueberry (Ericaceae: Vaccinium angustifolium). Ann. Entomol. Soc. Am. 95, 345–351 (2002). 4. R. Rader, J. Reilly, I. Bartomeus, R. Winfree, Native bees buffer the negative impact of climate warming on honey bee pollination of watermelon crops. Glob. Chang. Biol. 19, 3103–3110 (2013). 5. I. Bartomeus et al., Climate-associated phenological advances in bee pollinators and bee-pollinated plants. Proc. Natl. Acad. Sci. U. S. A. 108, 20645–9 (2011). 6. N. M. Williams, J. Regetz, C. Kremen, Landscape-scale resources promote colony growth but not reproductive performance of bumble bees. Ecology. 93, 1049–1058 (2012). Objective 1 Use population genetics to estimate bumblebee nest density in agricultural landscapes. Objective 2 Identify landscape pattern and farm practices that explain differences in nest density between farms. Objective 3 Evaluate pollination services for a perennial berry crop. I have made the significant progress towards completing Objectives 1, 2 & 3. Collected B. impatiens workers from each farm site during the 2016 summer field season. As outlined in my project timeline my intent was to complete items 1-3 by the end of January 2017. During January 2017 I spent over two weeks at the USDA ARS Pollinating Insect-biology, Management, Systematics Research Facility in Logan, UT. Under the supervision of research entomologists James Strange and Amber Tripoldi I successfully genotyped over 1700 B. impatiens specimens. This aspect of the project was the most uncertain and it completion is a milestone. I have cleaned the data, performed quality checks and will be using maximum-likelihood methods to assign relatedness and determine nest density in the coming months. 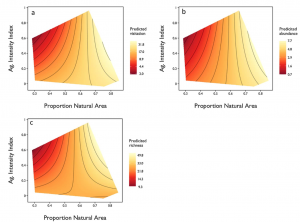 Paper Figure 4 Response of native bee (a) visitation, (b) abundance and (c) estimated species richness to the interaction of agricultural intensity and the amount of natural area within 2000 m of farm sites. Data are fitted values derived from final mixed effects models and log-transformed. Contour lines indicates areas of similarity. The convex hull delimits the sample space to the range of parameter combinations assessed in our study. Performed pollen limitation experiments at multiple farms to determine how much farms would benefit if pollinators were more abundant. I then compare multiple measures of berry quantity and quality under ambient pollination conditions to an experimentally supplemented treatment. Estimated the productivity of each farm, in berries per ha, under ambient pollination conditions. Combining these yield estimates with experimental results to estimate the yield losses resulting from pollen limitation. Paper Figure 2 Effects of wild bee visitation on pollen limitation for blueberry production and quality. Panels depict pollen limitation (i.e., hand pollination treatment – open treatment) for six key variables. A: Seed set; B: Fruit mass; C: Fruit set; D: coefficient of variation (CV) of seed set; E: coefficient of variation (CV) of fruit mass; F: date on which 25% of berries had been harvested. White symbols: 2014; grey symbols: 2015. Dashed horizontal lines indicate no pollen limitation, where open and hand treatments are equivalent. Curves are fit to pooled data from both years. All curves fit data significantly better than null models (Log-likelihood ratio tests); exponential curves are presented if they fit data significantly better than linear fits (Log-likelihood ratio tests). Paper Figure 5 Effects of pollen limitation on blueberry yield and revenue for each farm. Yield estimates combine fruit set and fruit mass effects using Eq. (2). White bars represent potential yield with ambient pollination (i.e., open pollination treatment). Grey bars represent added yield expected if pollen limitation is eliminated (i.e., hand pollinated treatment). 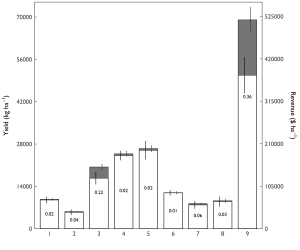 The ratio of grey to white bars is the proportional increase expected (indicated by the number within each white bar). Error bars represent +/- 1SD and are calculated independently for ambient and deficit portions of bars. Obj. 1 Use population genetics to estimate bumblebee nest density in agricultural landscapes. Study System – My study system consists of 15 conventional (n=6) and organic practice (n=9) highbush blueberry Vaccinium corybosum L. farms. Blueberry acreage ranges from <0.5 ha to 3.6 ha with a median field size of 1.1 hectares. Land cover in the region is spatially heterogeneous; residential exurban areas and small-scale agriculture are interspersed with second-growth forests dominated by maple (Acer spp. ), birch (Betula spp.) and beech (Fagus grandifolia). Agriculture in the region is a mix of pastureland and grain production, along with smaller fruit and vegetable operations. Few farms (n=3) in our study stock hives and reliable pollination for Vermont berry growers is therefore largely dependent on native bee visitation. Study Organism – The common eastern bumblebee Bombus impatiens is an abundant and important native pollinator of highbush blueberry. It is one of nine bumblebee species that are responsible for 70% of observed visits (Nicholson et al. in review). It is also very abundant at farm sites throughout the state, with B. impatiens specimens composing 15% of our previously collected specimens. Both of these attributes mean that collecting sufficient sample sizes will be neither problematic nor damaging to local populations. Bombus impatiens queens emerge in the early spring and forage until sufficient resources have been gathered to establish a nest. After nest establishment, Bombus queens switch to worker production and start producing genetically similar sister-workers who perform all foraging activities for the nest. In our observations of blueberry we typically start to observe workers foraging at the beginning of June; I will therefore concentrate our collection effort during this time. Genetic Sample Collection – I will collect B. impatiens workers in the first two weeks of June. From the center of each farm, I will search for bumblebee workers in the area of a circle with radius 300 m. I will divide the circle into quarters, and search each part for 15 min to maximize the detection of unique colonies present on each farm. I will immediately mark and store collected specimens in 100% ETOH to preserve DNA. Thirty individual B. impatiens workers will be collected from each farm. This sampling effort is similar to those in reported literature and should be a sufficient amount of genetic material (Drs. Shalene Jha and Jamie Strange, personal communication). Molecular Methods – I will extract DNA using the Insect Protocol with a QIAGEN DNeasy extraction kit. I will amplify DNA at 12 polymorphic microsatellite loci with a QIAGEN Multiplex PCR Kit (1000 reactions). I will use the same 12 simple sequence repeats (SSRs) for B. impatiens as a previously SARE-funded research (“Bumble bee nest density in diversified farms to ensure pollination services”, GN11-028) employed: BTMS0062, B124, BL15, B96, BTMS0081, BTMS0086, BL11, BT30, Btern01, BT10, BT28, BTMS0065. I will carry out polymerase chain reactions (PCRs) on samples using the QIAGEN Multiplex PCR kit. I will visualize PCR products on a capillary DNA sequencer and obtain fragment sizes using the GENEMAPPER software (Applied Biosystems). The outputs of this process are genotype plots for each sample that illustrate the location and concentration of SSRs for each sample. Using these outputs, I will determine relatedness with the sibship software COLONY v2.0.5.0 (7). This program uses maximum-likelihood methods to assign sibship or parent–offspring relationships and has been found to be the most reliable method available for assigning sibship in bumblebees (8). Estimating Nest Density – I will estimate the number of nest present at farm sites using statistical techniques similar to those developed for mark-recapture studies. These methods are based on the assumption that the fewer nests there are in a given area the greater the likelihood of sampling individuals from the same nest. Instead of trying to estimate the number of individuals, I am interested in estimating the number of nests represented by the DNA samples from workers. The program CAPWIRE can be used to obtain point estimates of the number of bumblebee colonies present at a farm from a subsample of workers (9). I will calculate per farm nesting density by dividing the molecular estimate of the number of colonies present by the area of the 300 m search radius. Statistical Analyses – To answer the Question 1.1 do perennial berry farms differ in the nest density of an important crop pollinator? I will use an ANOVA to determine if farms differ in their estimated nesting densities. In the next section I will use general linear mixed models to explore what explains differences in per farm nesting density. Landscape Classification – I have characterized land cover in circles with radii of 300m, 1000m, and 2000m centered on each farm’s blueberry crop. With these GIS I have conducted landcover analyses based on the proportion of natural area, here defined as the combined area of wetlands, mixed forests, shrublands and scrub areas. I have also calculated landscape diversity (Shannon-Weiner H’) for each radius for each farm. To obtain relative measures of spatial pattern I have analyzed each map with FRAGSTATS 3.4. This spatial pattern analysis program provides metrics of spatial heterogeneity (e.g. edge density, perimeter-area ratio, average patch size) that I use to relate landscape configuration and nest density. I have also surveyed the flowering plant diversity and abundance in each habitat type within a 300m radius centered on the blueberry crop. With these data I can assign farm-specific floral resource availability values to different habitat types. This offers a more ecologically explicit measure of habitat quality. Farm Management Surveys – I have surveyed all primary owners of the 15 farms involved in this study and collected data on pest management practices (e.g timing and frequency of insecticide, fungicide and herbicide application), fertilizer application, organic certification and alternative crops grown. I also inquired about farmer perceptions of native pollinators and whether or not they consider pollination critical to the yield of their crop. These survey results not only provide me with metrics to use in analyses, but understanding of the perceived importance of wild bees. Statistical Analysis – I will perform all statistical analyses in R v.3.2.1 (R Development core Team 2015). I will use linear mixed effects models with AIC model selection to determine which models to retain. To answer the Question 2.1 what are the effects of landscape pattern on bumblebee nest density? I will analyze the effect of landscape pattern, evaluating both the effects of habitat composition and configuration as well as the availability of alternative floral resources, on B. impatiens nest density. To answer the Question 2.2 how do different farm management practices influence bumblebee nest density? I will test for the effects of farming practice by modeling nest density with simple linear mixed effects models with pesticide application, crop diversity and farm management (organic = 1; conventional = 0) as separate fixed effects. I will also compare previously observed bumblebee abundance and visitation rate to estimated nest density with simple linear regressions. Pollinator Limitation Experiments – To answer the Question 3.1 do differences in nesting density, abundance and visitation translate into differences in yield? we perform pollinator limitation experiments. Based on our observations of species abundance and visitation rate, we hypothesize that difference in fruit-set and fruit weight between pollinator-excluded and open-pollinated flowers will be greater in farms with diminished bee communities. At 9 farms we selected 10 bushes of the same cultivar (Bluecrop). On each selected bush, we mark four branches of similar-aged flower clusters with flowers close to opening (hereafter, clusters). We randomly assign two clusters to be open pollinated, while the remaining two cluster are hand pollinated. To hand pollinate flowers we collect Bluecrop pollen from nearby bushes and gently apply pollen to each open flower with a paintbrush. Approximately 1 month later we count the number of fruit on clusters to determine proportion fruit-set. We collect berries from clusters as they ripened and brought them to the lab to be weighed. Comparison between hand and open-pollinated flower clusters allowed for estimation of the amount of fruit set and yield attributable to insect visitation. Per Farm Yield Estimation – During the 2016 summer field season I will extend our yield experiments by determining per farm yield estimates. On each of the 9 farms included in the pollen limitation study I will select another 10 Bluecrop bushes. On each selected bush, I will count the number of fruit bearing branches. I then will randomly select four branches and count all immature fruit on each branch. I will then count the number of bushes per farm. I will calculate per farm estimates of yield as: (berries/branch) • (branches/bush) • (bushes/farm). This value will return an estimated number of berries per farm, which I will convert into kg using an empirically determined average berry weight. Where P is the average price per kg of blueberries in Vermont farm and V is the expected value of pollination for a farmer. I will then statistically relate these economic values to our measures of nest density to demonstrate how landscape pattern and farm management not only impact pollinator populations, but farmer livelihood as well. This project is still in its early stages and its major contributions are forthcoming. I expect that the results from this project will connect agricultural landscapes, bumblebee populations and yield gaps in a novel and previously unreported way. Two related publications have coincided with my progress on this project. The first (Nicholson et al. 2017 Agriculture, Ecosystems & Environment) has established the analyses necessary to answer the questions proposed in Objective 2. The second (Nicholson & Ricketts, 2018Agriculture, Ecosystems & Environment) develops the methods and analyses necessary to complete Objective 3. In addition to the mentoring experience previously reported I have gained valuable collaborators directly as a result of the opportunities provided me by this NE-SARE grant. My time at the USDA-ARS Logan “bee lab” was incredibly valuable; I expanded my network of bee researchers and learned how my data fits into larger national assessments of bumblebee population genetics. With graduate students at other landgrant institutions I will be involved in a project that explores the drivers and impacts of bumblebee nest density across three important growing regions of the US. In brief, my accomplishments to date are: collection of specimens, preparation of specimens for DNA extraction, extraction of DNA from specimens, genotyping specimens, characterizing landscape pattern and farm management, and combining field experiments and economic methods to estimate the quantity and quality of blueberry yields. I am nearing the completion of the proposed work. I will be submitting a final report later this month. I have presented findings from this research at invited seminars and conference talks. During 2018 I completed my analysis of nest density and how landscape and farm management factors impact bumblebee populations. I have completed a manuscript of these findings, which will be submitted to a journal focusing on applied ecological research in late Spring 2019. During 2018 I also successfully defended my dissertation and received my PhD. I continue to share my findings with our Vermont agricultural community, and I will be hosting a farmer information exchange on March 1st, 2019. Former VT Secretary of Agriculture has also reached out on our behalf to the Across the Fence team to coordinate an expose of our research. I will present my findings at related fruit and vegetable grower societies via a fact sheet. I will host a farmer information exchange on March 1st, 2019 to share the findings of this research.